A series of lectures is offered by Yuchengco Museum exploring different dimensions to our National Hero, Jose Rizal. 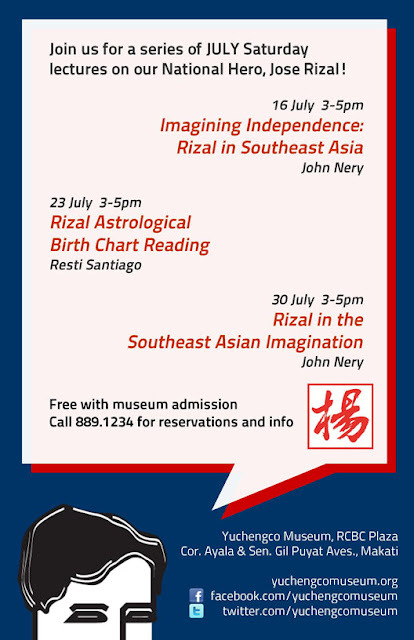 For three Saturday afternoons in July, learn more about Rizal's influence on Southeast Asian history and culture, and whether Rizal's destiny as a martyr was written in the stars. All talks are free with museum admission. To register, call (632) 889-1234 or email info@yuchengcomuseum.org. Yuchengco Museum is located at RCBC Plaza, Corner Ayala and Sen. Gil J. Puyat Avenues, Makati City. Learn more about the influence of Rizal, The Great Malayan, on Southeast Asia. To kick off the lecture series, Philippine Daily Inquirer columnist and senior editor John Nery discusses political uses of the image of Rizal as Malay genius and freedom’s martyr in Indonesian history: the emergence of the independence movement, the last days of the Japanese occupation, and Sukarno’s reigniting of revolutionary fervor. Nery also looks into Malaysian uses of Rizal’s image. Join astrologer Resti Santiago on a journey into Rizal’s life as he examines the National Hero’s astrological birth chart. Get astrological answers to some of the questions surrounding Rizal, and find out how his free will interacted with his fate. Rizal’s image as a patriot and pioneer has sparked the imagination of Southeast Asian writers and academics for decades. In his second lecture, Philippine Daily Inquirer columnist and senior editor John Nery focuses on cultural uses of Rizal’s image: the 1944 Indonesian translation of Rizal’s farewell poem, Mi Ultimo Adios; the 1977 discussion by Malaysian scholar Syed Hussein Alatas of Rizal’s essay, On the Indolence of the Filipinos; and the 1980 use of Rizal’s entire career as a crucial plot device in a seminal novel by Indonesian author Pramoedya Ananta Toer. John Nery was a Visiting Research Fellow at the Institute of Southeast Asian Studies in Singapore and is the first Sandra Burton Nieman Fellow in Journalism at Harvard University. A senior editor and columnist at the Philippine Daily Inquirer, he is at work on a second book, on Rizal's Tagalog correspondence. Resti Santiago has been widely featured on top television and radio news shows to shed light on various aspects of Western astrology. He has had more than a decade of astrological study, training, and education under world-renowned astrological masters. The Rizal Lecture Series is one of the highlights of the RIZALizing the Future exhibit at Yuchengco Museum, on view from June 3 to October 29, 2011. For more details, visit Rizal Exhibit and Lectures at Yuchengco Museum.